Choosing a diamond size for your nose jewelry is a matter of personal preference. All of our diamonds are stunningly dazzling regardless of the size. 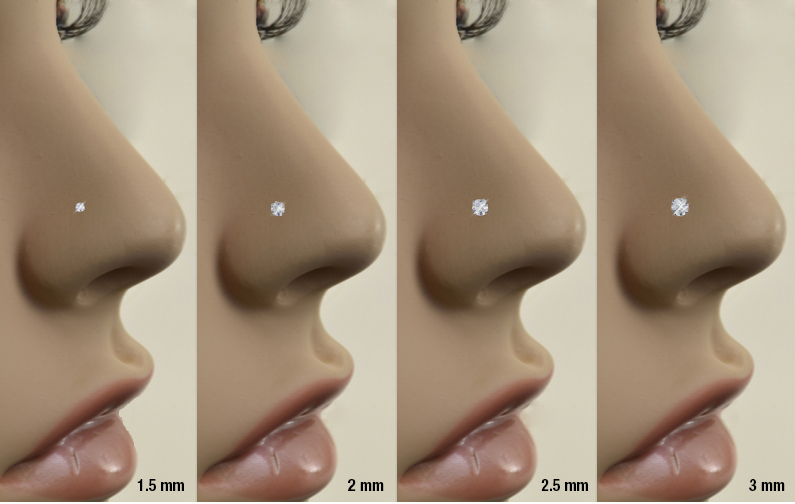 The information below is meant to help give you an idea of what you might want to choose for size options, however, your nose is unique. Taking into account your features and piercing placement is helpful when making your choice, but most importantly, choose a style that makes you feel like the beautiful and unique individual you are! If you happen to receive it and wish you had of chosen a little larger or a little smaller, we do offer exchanges. Please review our return policy for more information. 1.3-1.5mm: Discreet and dainty. For a touch of sparkle. 2mm: Still a dainty look with extra dazzle! 2.5mm: Not too little, not to much, perfectly beautiful! 3mm: Absolutely dazzling for those that love to shine! The diamond color evaluation diamonds is based on the absence of color. A chemically pure and structurally perfect diamond has no hue, like a drop of pure water, and consequently, a higher value. When diamonds are graded for color, the scale used is based on the Latin letters ranging from D to Z. D being the purest colorless color. D, E & F color diamonds are considered colorless. G-J as near colorless diamonds. Differences between these are rarely noticeable with the naked eye. K-M possess visible yellow tint. We do not purchase diamonds in these categories. Natural diamonds are the result of carbon exposed to tremendous heat and pressure deep within the earth. This process can result in a variety of internal characteristics called ‘inclusions’ and external characteristics called ‘blemishes.’ Evaluating diamond clarity involves determining the number, size, relief, nature, and position of these characteristics, as well as how they affect the overall appearance of the stone. While no diamond is perfectly pure, the closer it comes, the higher its value. IF – Internally Flawless: No inclusions visible under 10x magnification. VVS1 and VVS2 – Very, Very Slightly Included: Inclusions so slight they are difficult for a skilled grader to see under 10x magnification. VS1 and VS2 – Very Slightly Included: Inclusions are observed with effort under 10x magnification, but can be characterized as minor. SI1 and SI2 – Slightly Included: Inclusions are noticeable under 10x magnification but are rarely seen with the naked eye. It should be noted that all of our diamonds are dazzling as we are very careful to choose only the highest quality in clarity and color. Gauge refers to the thickness of the post that inserts into the nostril. When choosing a gauge size it is best to measure one that you already have that fits nicely, with a caliper (this is a proper measuring device found in most tool boxes). If you do not have one, here this how the conversion works: Gauge sizes are measured in millimeters. If you look at a standard ruler you will find millimeters between the centimeter measurement. 10 millimeters equals one centimeter. The thickest Gauge is 18 Gauge. This would be your choice if you have recently had your nose pierced or wear that gauge normally. 20 Gauge is thinner than 18G and is the standard most popular size. If you are unsure this would be your best choice. 22 Gauge is the thinnest size post and perfect for those who normally wear silver nose jewelry, from jewelry stores such as Claires (the majority of their silver nose jewelry comes in thinner gauges). Please refer to the chart below to see what gauge would be your best choice. Please also note the nose piercing is one of the fastest and most adaptable piercings, and will adapt to whichever size gauge you put in it. If you have an 18G piercing you can wear 20G nose studs, nose screws or nose rings as well and your piercing will adapt very quickly. If you want to go back to an 18G, it can also adapt. If going from a thinner gauge to a thicker gauge, you can stretch your piercing by putting some pure vitamin e oil on your nose jewelry and your nose piercing and slowly guiding the stud through. If you are going from a thicker gauge to a thinner gauge, place the stud in just before bedtime and place a small round band-aid over top to keep it from falling out. By morning it should be adapted and wearable. Please note, you should only go up or down by one gauge at a time. (Straight Style) – Choose this style if you would like to bend the item yourself or have someone do it for you. Straight nose studs are not meant to wear straight. We offer them for those of you that know exactly what you like and choose to customize yourself. This style comes with a small ball on the end to keep the jewelry from falling out. The nose piercing adapts very quickly so the ball does not need to be much larger than the gauge of the nose bone in order to keep it securely in place. You may experience some discomfort when putting in or taking out this style as the ball is thicker than your piercing but this is normal. This style is preferred for those that don’t like the feeling of an L bend or screw style inside their nostril, or that want to be sure the post will not be seen within the nostril. The nose screw has a u shaped bend or curve that will flow with the natural curve inside the nose. This curve keeps the jewelry in place and offers a more comfortable insertion that the nose bone style. It is offered in both right and left curve bends. Choose the right bend nose screw for the right nostril and the left bend screw for the left nostril. The L bend nose jewelry style is the most popular choice offering comfortable insertion with an L style bend in order to keep the jewelry secure. It is preferred by those that don’t like the fuller feel inside the nostril of the nose screw. Nose rings are circular hoops that come in several styles and forms. Open hoops have a opening within the ring and a small ball on the end, similar to the nose bone, to keep the jewelry secure. Seamless hoops offer a cut within the circle that is bent only to insert the jewelry. Then bent back for the nose ring to be complete circle within the nose piercing. Segment rings are similar to seamless rings however there is small section of the jewelry that is removable for insertions. Clicker rings offer a similar removable segment but the difference is the segment remains attached to the ring for insertion. These rings can be worn in many different piercings other than the nose, such as tragus, helix piercings, cartilage and ear piercings, septum piercings etc. Septum nose rings are designed to wear in the middle section of the nose between the two nostrils. They also come in several hoop designs including segment rings, seamless rings, and our most popular the septum clickers. Keep in mind that when you are choosing your style, each of our designs comes with a free nose ring backing. This is very small rubber o-ring that sits on the wearable length of your jewelry piece. It is great for added security. Keeping your nose jewelry stone snug to the outside of your nose as well as can be used to shorten your wearable length if your piece feels a little loose. If you find that your choice does not fit the way you had hoped. We offer one free adjustment alteration. The wearable length for nose jewelry is measured just under the stone where the post begins, to where the post bends. It is the length of the post that will be inside your piercing. It does not count the part of the nose jewelry that is outside of your piercing. So for example, it would only count the part of a nose screw that is within the flesh of the nose but would not count the part of the nose screw that is within the nostril or on the outside of the nose. There is an exception to this with the straight style. The Straight style length is the length of the post from beginning (measured just under the stone) to the end. You would then choose to bend it to your desirable wearable length. The nose bone is measured also from just under the stone to just before the ball on its end. There are a few different ways to figure out what length of post (wearable length) you should choose. This measurement will be in millimeters. If you have a proper measuring device such as a caliper (a basic measuring tool found in most tool boxes or garages), using it to measure the thickness of your nose is the best and most accurate way. Be sure to set the caliper to millimeters. If you do not have access to a caliper you can use a standard ruler. One side of the ruler should be in centimeters. You will notice small dashes in-between them, these are millimeters as shown below. Place your thumb or pointer finger inside your nostril and pinch lightly. Remove carefully trying to keep your fingers in the same position and measure the distance (space) between your finger and thumb against the millimeters on the ruler. Another way is to measure a nose jewelry piece that you currently have and use it as a reference point. It is best to add a millimeter or two if you are unsure as it is better to choose the length as slightly too long than too short. Our specially designed nose ring backings will allow you to shorten the wearable length to your perfect fit. Please note: If you are ordering a straight stud the measurement will be of the entire post. Straight studs are chosen when you wish to bend the nose stud to the desired wearable length on your own, or by your piercer. Standard wearable length is 6.5mm. When choosing a precious metal it is a good idea to match it to your preferred jewelry style. What is the most common type of jewelry you own. If you wear sterling silver regularly we would suggest going with white gold or platinum. If your earrings are all yellow gold, you may want to go with the our yellow gold styles. The Karat of the gold refers to its purity. The higher the Karat the closer to pure gold the jewelry piece will be. Higher purity also results in a softer metal more pliable metal. White gold in its natural state is not actually white in color. It is a very pale yellow gold. For that reason white gold needs to be rhodium plated in order to give it a bright white finish. White gold can be alloyed with nickel, although most of our pieces do not contain nickel. If you have a nickel allergy please contact us with your desired item and we can let you know for certain if there is any trace of nickel. Yellow gold has a beautiful warmth to it and is a classic choice. All of our yellow gold nose jewelry is nickel free. Although colors of gold are quite similar, 14k yellow gold is slightly lighter than 18k gold. Yellow gold can also make warmer colored diamonds appear more colorless, as the yellow color offsets a well-cut diamond. Rose Gold has become increasingly popular with its subtle and delicate rose or pinkish color. It is truly a beautifully and unique style choice. Platinum is a very durable white metal that is more dense than gold. It is known for its strength and prong security offering a strong setting for a diamond. It is also highly recommend for those that have experience allergies with other metals as it is generally considered safe from allergic reaction. 24k gold is also known as pure gold. It means that all 24 parts in the gold are all pure gold without traces of any other metals. It is known to be 99.9 per cent pure and takes on a distinctive brighter yellow color. Since this is the purest form of gold, it is naturally more expensive than 18K or 14K gold. However, this type of gold is lesser in density as compared to gold of a lower karatage which makes it softer and more pliable. It also offer the least likely to tarnish. 18K gold is 75 per cent gold and is slightly lighter in color than 24K gold but still offers a brighter yellow gold appearance. It is also least likely to tarnish. 14K gold contains 58.5% gold and is a great compromise for a gold metal. It is still quite durable and will not easily tarnish. It also has a softer yellow gold color than 18K. The difference in durability between 14K to 18K or 24K gold is noticeable as it is much less pliable, although still a great choice.